With the ever-shifting economy your retirement years may be further than you expect. My good friend and fellow writer, Regina Duke is enjoying a rewarding writing career during her retirement. But her writing career started long before she left her day job behind and she has graciously agreed to share her experience with us. Tell us about your experiences as a writer pre and post retirement. I have been writing novels, novellas, and short stories since I was thirteen. I began submitting to publishers before 1980, but until I had a computer progress was slow. While working full time, I would retreat into my fictional worlds at night and on the weekends. I preferred to spend time with my own creations rather than lie on beaches or go to movies. Between 1980 and 2006 (when I retired) I had written eight novels. Four of them were pretty good, and those were the ones I began submitting to traditional publishers. After I retired, I thought I would have all the time in the world to write. That was my plan. Write, write, write. Build up that body of work and keep submitting. Well, life gets in the way sometimes. My mother’s health declined rapidly and she passed away in 2008. Nothing deadens the creative impulse like losing a loved one. Unfortunately, one of my sisters also began to deteriorate. She could not bear the heartache of losing mother. By 2010, she was in permanent care. Only after seeing to her placement could I finally take a deep breath and get back to writing fiction. So don’t wait for retirement to write, because I guarantee life will have some surprises along the way. Write, right now! And when the time comes to publish, you will be ready with a body of work. What’s the best thing about your writing life now? It’s all fiction and dogs, all the time! LOL Once I plunged into indie publishing in February 2011, I dedicated myself to producing five titles a year. Some are novellas, some were written years ago and needed fresh rewrites and editing. And some are brand new (like The Wedding Wager). I love being able to share my characters and my stories with an audience, and that motivates me to write non-stop. However, the missing element was a schedule. After retiring, you must create your own schedule, or every other fun thing will take precedence. So I have a schedule and I stick to it. I set a goal when I am working on a new book and push hard to reach that goal every week. I set deadlines, and although I am usually a week or two late, I am much more productive when I know I am working toward a deadline. And the all-time best thing is having the time to devote to both my writing and the promotional activities needed to get my books out to readers. What advice do you have for writers who are trying to balance their writing with a day job? Sit down and make a chart of your daily activities, including your hours at work. If the only time you have for writing is your lunch hour, then that is when you must write. Take your laptop or your legal pad and find a quiet spot to spend your lunch. No time to spare at home? Really? How many hours of television to do you watch in the evening? Turn off the TV. Go in the other room (if your family wants to watch). Move away from the “idiot box.” You can always record your favorite program, and schedule a time for watching it later. At one point, I took cable out of my house to increase my writing time. Maybe it’s because I am old enough to be retired, but for me, learning social media was a lengthy process. I am still learning, in fact. So one thing you can do for your writing career before you retire is begin building your social media platform. Start learning how to build and maintain a website. Start a blog. Get a Facebook page and start adding friends and likes. These activities will serve you well when you finally get that first novel published. And have fun! You are finally fulfilling your lifelong dream! 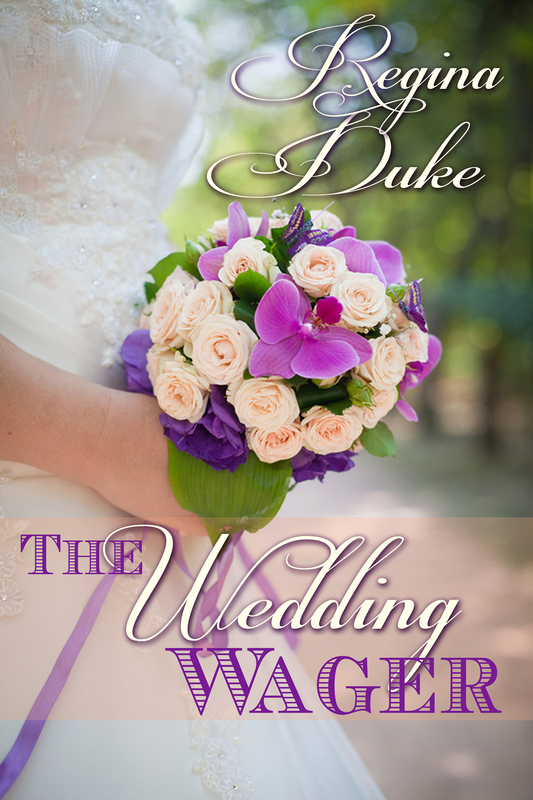 THE WEDDING WAGER Megan leaves the hospital whole but in despair. Can Kevin heal her heart and save the family fortune?